The party stayed going all Saturday night. Now it's Sunday morning, and you've got a house full of people. Time to bring out these amazing personalized Bloody Mary glasses! 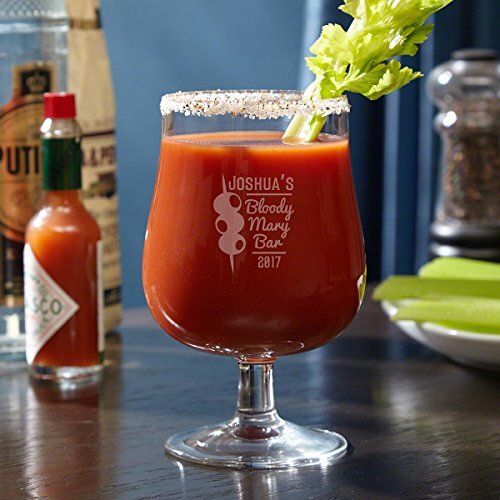 Engraved with our exclusive three olives design, each hurricane glass includes the name and year of choice, framing the phrase Bloody Mary Bar. The perfect gift idea for housewarmings, birthdays, and more. Our hurricane Bloody Mary glasses measure 5.75 tall with a 3.5 diameter. Made from premium glass with a shapely silhouette, these stemmed cocktail glasses hold up to 15 ounces of mixed drink or liquor.